Part No. 72170 Handle: For welding at the desired angle to HDV5200/WW & HDV5200/SW Weight: 10.3 oz. Part No. 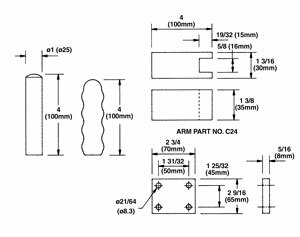 72171 Grip: To fit Part No. 72170 handle Weight: 4 oz. Part No. 72172 Arm: For extending the stub arms of HDV5200/WW & HDV5200/SW Weight: 1 lb 8 oz. Part No. 72173 Base: For bolt mounting HDV5200/WW & HDV5200/SW Weight: 7 oz. HDV5200/WW or HDV5200/SW Handle 10.3 oz. HDV5200/WW or HDV5200/SW Arm 1 lb. 8 oz. HDV5200/WW or HDV5200/SW Base 7 oz.